Brief update then US felt and eco print workshop details at last! Phew, it’s been a very paperwork heavy week or so, yesterday I finally had to admit defeat and give up on the big submission I was trying to get together because there are currently just too many exciting things happening at once at Clasheen. I don’t want to drop the ball on the website side of things or postpone preparing for upcoming workshops, I also need to make some work for an imminent fashion photo shoot and finally, my new wood burning central heating system is being installed this week. Over the next week or so Patrick will be finalising the change over of this blog to the website and the online shop will be going live there too. There will be quite a bit of formatting and editing for me to do re the blog I think, I don’t however want to lose all that I’ve written here since I started in 2008! Please bear with us while the transfer is ongoing. So, without further ado, here are the details for my April and May workshops in North America, they will also be published on the website some day this week. Apologies if this post is a little word heavy, it’s difficult though not to be wordy when trying to write up workshop descriptions accurately. To say I’m excited is an understatement, I’m so looking forward to this visit!!! During this intensive two day workshop participants will explore the fascinating and exciting art of printing on protein based fabric and paper using natural materials from the hedgerow, kitchen and garden! Using simple, easy to find natural plant materials bundles will be created by tying the organic matter up tightly in various weights of felt, silk, wool and silk/wool blends. Nicola will bring a good selection of samples with her for participants to study and she’ll explain how she achieves different effects and strong leaf outlines depending on fabric pre-treatment, materials used, pot selection and various other determining factors. Different ways of folding, bundling and tying the fabric also help to create different designs in the finished pieces. Once wrapped, the bundles will be heated for hours to aid the release of colors from the organic matter, when onion skins or other items are included in the dye pot wonderful lines will be achieved where the string ties act as a resist. NB Where local hedgerow materials are not available we will substitute easily located vegetation from the florist. Over the course of the two days we will have a selection of pots on the go so participants will have plenty of options and decisions to make. We will also be able to print on paper or card, naturally printed heavy duty manila luggage tags make particularly beautiful gift tags. Participants are encouraged to bring along plenty of silk and wool yardage, scarves, previously completed felt bags, vessels and wall hangings (not just wearables) as well as plain thrift store clothes in wool or silk. These may all be included in the dye pot, the more the merrier, space providing! Attention will be paid to the after treatment and care of these naturally printed textiles and participants will learn how Nicola prepares her work for sale or gifting. NB Nicola likes to restrict printing to cream or white items during a workshop as this avoids commercial dyes running and ruining someone else’s work. If participants are keen to try printing coloured items it’s possible we can put one of the pots aside for this on day two, this will depend on the requirements and best interest of the group as a whole. Printing on cellulose fabrics is a much more time consuming process than printing on felt, silk and wool, results can be varied and are often disappointing. During this one day class participants who have previously completed a natural printing workshop with Nicola will be able to learn the different ways that cellulose fabric may be encouraged to hold a print. Nicola’s been having great success with linen and cotton this year achieving many really clear and beautiful leaf imprints. Some of the pre-treatments are very time consuming and possibly may not be to everyone’s taste or even smell, others are quicker and seem to result in good prints and colourfast results. This advanced class will share the tips and tricks that Nicola is finding helpful in her own artistic practice to achieve good prints on linen and cotton. During the nuno wrap workshop on Saturday 24th Nicola will share with participants the tumble dryer method of wet felting, a stress free way of coercing wool and embellishing fibers into silk to create a rich and colorful piece of wearable art. Because there is almost no rolling or rubbing involved participants are free to enjoy the creative process, it is also ideal for those find regular felting methods too tiring! 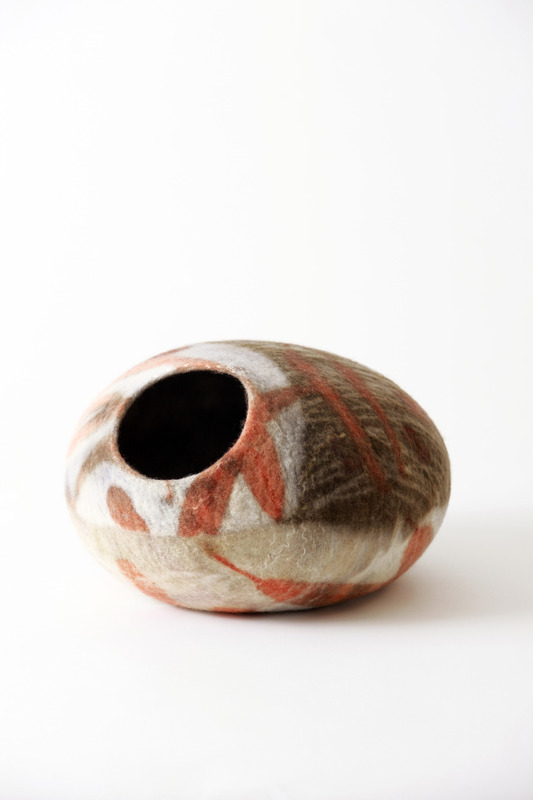 In the vessel workshop on Sunday 25th, Nicola will share with participants the skills needed to design and felt a simple vessel or coin purse using the resist method of three dimensional felting. Old pieces of silk and lace as well as treasured bits and bobs are often suitable to be incorporated into the felt. Should they wish to,, participants are encouraged to bring along a selection of their favorite stash items and Nicola will help them design one off pieces using these as a starting point. 16th – During this one day workshop beginners and more experienced felters will have fun learning and experimenting with the fascinating technique of three dimensional wet felting around a resist. The emphasis during the day will be to have fun in a creative and supportive environment, participants may expect to leave with the knowledge and confidence to replicate the techniques learnt successfully at home. Beginners may expect to lay out and finish a vessel or coin purse during this workshop (with plenty of surface decoration!) while more experienced felters and improvers can discover how to add inclusions such as stones, glass nuggets or other found objects into their felt. Everyone will have the opportunity to experiment with surface design, a gorgeous selection of raw alpaca locks, silk, bamboo, Firestar and other embellishing fibers are included in the cost of this workshop! 17th – Wet felted flowers make wonderful jewellery, scarf closures, hair accessories and colourful accents to brighten any outfit; alternatively they are perfect for adding a decorative element to interior and exterior design schemes! During this three hour workshop Nicola will share with participants how to create stylish flowers using merino and alpaca plus a selection of embellishing fibres including silk, bamboo and Firestar. Intermediate and more experienced felters will learn the techniques necessary to add multiple stamens, felt ring backs or several layers of petals all at once; each flower will be created totally from wet felting, no need to sew a stitch! 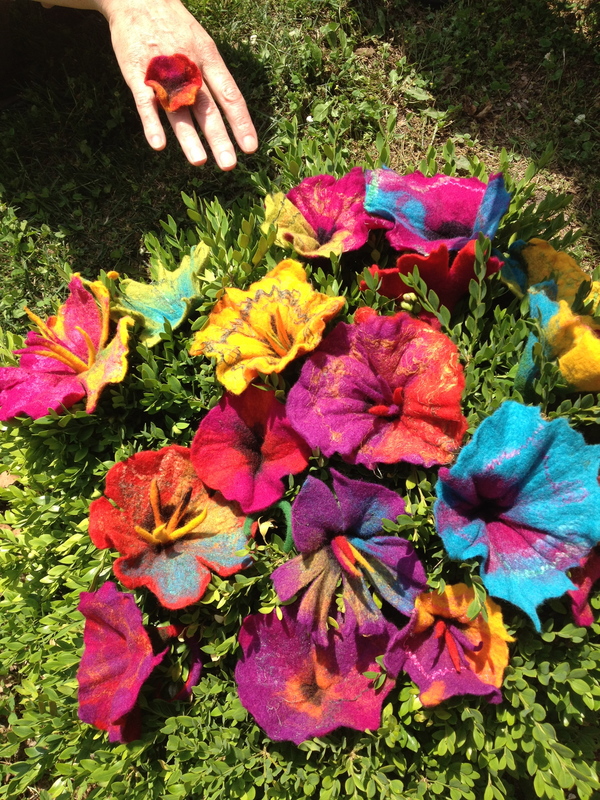 Gorgeous and colourful felt flowers felted during a previous workshop at the Kentucky Sheep and Fiber Festival! Day one – using either the open or closed resist method of wet felting participants will learn how to design templates to create different shaped pieces then scale these up in order to cut out their own plastic resists. Nicola will demonstrate how to lay the wool tightly around the resist and by the end of the day everyone will have a beautifully finished simple vessel or purse ready to print on day two, no obvious ridges or seams in sight! Working in white, participants will learn which embellishing fibres work best in the eco printing process, Nicola will bring a selection of these with her for people to share and include in their work. NB If anyone would prefer to felt a nuno scarf this will also be possible providing Nicola and Jan know in advance! Day two – Using simple, easy to find natural plant materials our three dimensional felt from day one will be transformed into beautiful and colourful art using the exciting eco printing technique! We will also work with silk scarves and yardage, participants are encouraged to being along a selection of previously felted work, upcycled clothing and undyed wool or silk yardage to get the most from this full day of printing. Nicola will bring a good selection of samples with her for participants to study and she’ll explain how she achieves different effects and strong leaf outlines depending on fabric pre-treatment, materials used, pot selection and various other determining factors. Different ways of folding, bundling and tying the fabric also help to create different designs in the finished pieces. Once wrapped, the bundles will be heated for hours to aid the release of colors from the organic matter, when onion skins or other items are included in the dye pot wonderful lines will be achieved where the string ties act as a resist. Using simple, natural plant materials learn how to transform felt, silk and wool yardage or clothing into beautiful wearable art using the eco printing technique. Participants are encouraged to being along a selection of previously felted work, upcycled clothing and undyed yardage or scarf blanks to get the most from this full day of printing. 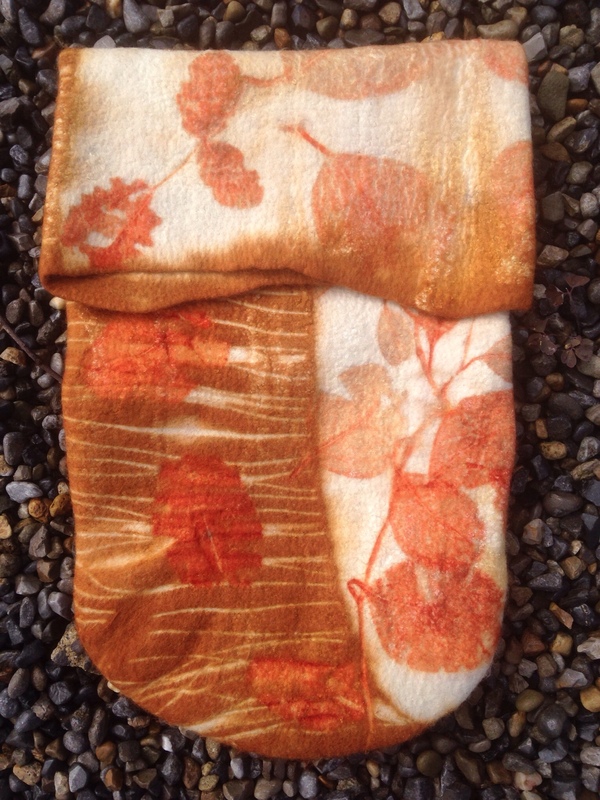 This entry was posted in America 2015, eco printing workshops, felting workshops, workshops and tagged Clasheen, eco printing, eco printing workshop, Felting, US workshops by Nicola. Bookmark the permalink. Oh, and if you’d like you can change the registration information above to have people contact me….I went ahead and sent out the email yesterday to my mailing list, so have begun the registration process. Thanks a million, Nicola…..Can’t wait to see you soon. Don’t eat it all before I get there Dawn, you know how much Art and Judy’s butter pecan means to me!!! I so wish I lived in the US! Do you plan on coming to Australia (Queensland) any time soon? I am always very impressed with how much you do, make and impart to others, and Nicola! have a wonderful five state tour! !